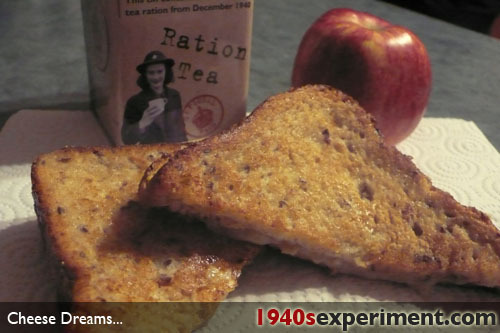 This entry was posted in Uncategorized and tagged 1940s experiment, 1940s ration diet, bbc, carolyn ekins, losing 100lbs, wartime kitchen and garden, wartime recipes. Bookmark the permalink. sort of a poor man’s monte carlo, i like it. more protein despite less cheese. Thanks Kellie- it tasted nice but used up quarter of my cheese ration for the week even though I didn’t use much cheese! Nevertheless, as a naughty snack, it was very enjoyable…….yum! Cheese glorious cheese! The one food I really struggle to ration. But I’m determined to follow your lead. I made a batch of Meaty Gravy at the start of the week, then portioned it up in the fridge. !st meal- heated over steamed veges, including potatoes fresh from garden. Yum. 2nd meal- layered in casserole with steamed spinach, topped with sliced potato, a little white sauce & 1/2 oz grated cheese. Cooked until taties cooked. It made a really filling meal & I appreciated the cheese so much more. Tonight I’m going to add sliced portobello mushrooms & a little vege soup powder & call it goulash; serve with rice. My body is still adjusting to not snacking, but I had a thin slice of fruit loaf & a small glass of milk for supper. Do you think people would have often gone out to a cafe for tea & a bun? Would it have cost points? I usually meet dd once a week for coffee for a treat. I live next door to a cafe called ‘Victory Garden’, they barter produce and preserves for coffee. Every Friday across the road in the park there is a community vege swap run on a similar principle. Oh yes people did eat quite regularly from mobile canteens and cafes etc…. buns and the like were available except it was illegal to sell buns and cakes with icing on. No eating out didn’t cost you your points (as far as my research shows anyway) but purchasing food from stores to take away and use in the home did. How cool is it that you live next to a cafe called Victory Garden!!!! SNACKING- yep that is one of the hardest things I found too. BUT after a couple of weeks you adjust and end up eating 3 good meals a day and even a snack for supper with a glass of milk and feel very contented! Looking forward to hearing how you get on!! I am bring my recipe books to work today to plan tonights meal! My mother once made ‘cheese dreams’ and they were divine! Much better than her ‘dry bread and salt water gravy’ which was salt water coloured with sugar burnt on a spoon and thickened with plain flour and poured over dry bread. And yes, it was as awful as it sounds. It was a frequent meal for Isabelle! Cheese dreams take me back to my Girl Guide days in the fifties. Not long after the war my Mum was still using many of the recipes that you are using Carolyn. I remembered the name of cheese dreams that my mum made but, I don’t remember her dipping them in egg. Perhaps it was the double gloucester cheese that made them so tasty. The classic toasted cheese sandwich(processed cheese slices used) here in Canada pales beside the “cheese dreams” of over ‘ome! I used to make these as a Girl Guide in the 80s although we didn’t dip them in egg, instead we had the buttered side of the slices of bread on the outside and put them in a hot frying pan but without any extra fat, yum!